First 14:30-14:40 UTC: Order of WE-WISH, RAIKO by Astronaut Akihiko Hoshide. Second 15:35-15:45 UTC: Order of TechEdSat, NanoRack/F-1, FITSAT-1 by JAXA GS. JAXA have announced the deployment of five CubeSats from the International Space Station (ISS) planned for Thursday, September 27 at around 15:10 UTC and will be broadcast live on the web. The CubeSats are mounted in a JEM-Small Satellite Orbital Deployer (J-SSOD). 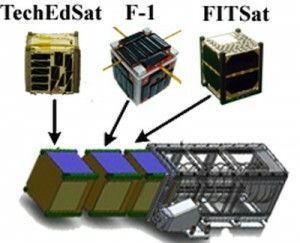 In one pod are FITSAT-1, TechEdSat and F-1 (NanoRacks) and in the second pod is WE-WISH and a scientific 2U CubeSat RAIKO. http://ncasst.org/techedsat.htmlTelemetry downlink on 437.465 MHz. This entry was posted in Satellite and tagged Cubesat, Fitsat-1, ISS by PE0SAT. Bookmark the permalink. it now about the release enforcement day after the postponement.